Date: Dec 7 2018, 3:30 p.m. - 6 p.m. PLEASE NOTE: The Tree Lighting starts at 4 p.m., doors will open at 3:30 and activities will begin at 4 p.m. 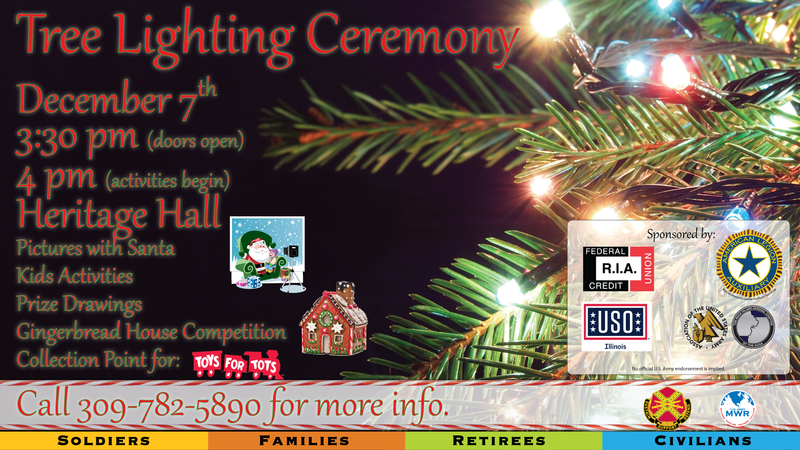 This year's Tree Lighting Ceremony is made possible through support of our sponsors: Rock Island Arsenal Federal Credit Union, Walcott American Legion Auxiliary #548, The Rock Island Arsenal Chapter of the Association of the United States Army and USO of Illinois. No official U.S. Army endorsement is implied. Come ring in the holiday season at Heritage Hall as we light the garrison tree. Enjoy pictures with Santa, holiday music, children's activities, prize drawings, and much more. We are looking for participants for the 2nd annual Gingerbread House Contest at Rock Island Arsenal. The contest is open to all organizations or individuals on the installation. The Tree Lighting Ceremony will once again serve as a collection point for Toys for Tots so please consider bringing new, unwrapped toys to help make the season a little brighter for less fortunate children in our community.